All our building work is soon to be complete. We're now less than 2 weeks away from returning (our first Sunday service back on site is 14th June 8am, 10am, 5pm). Today's work includes the installation of our new entry Canopy, continued work (and a little re-work) with concreting, as well as many small details inside (the Parents room to Old Church 'link' for example). Its exciting to be this close to returning. 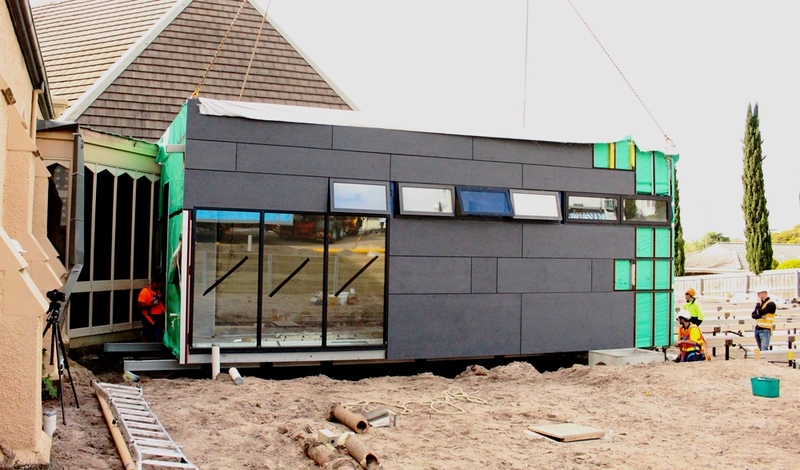 As with most building projects, we're anticipating that there'll still be a little work to do once we return (landscape gardening, purchasing some furniture, etc) but from 14 June it will be all systems go (especially with our Kids Club holiday programdue to begin on June 29th). 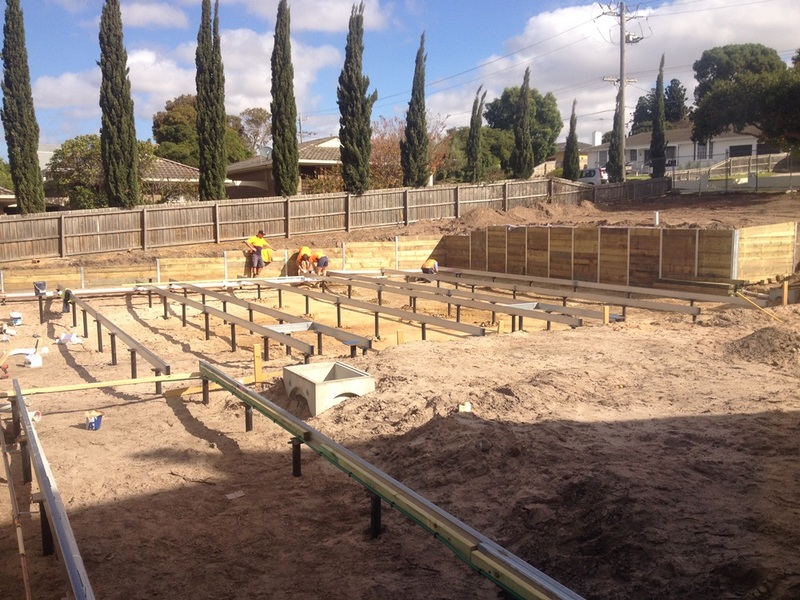 The South Valley Rd carpark is ready for concrete curb and channel work, and the courtyard just beyond is soon to have synthetic grass installed. What a great improvement to our South Valley Rd entrance this is (if you compare with what it used to look like). Much more obvious where the entrance is, much more people-friendly - what a church of God's people should be like! 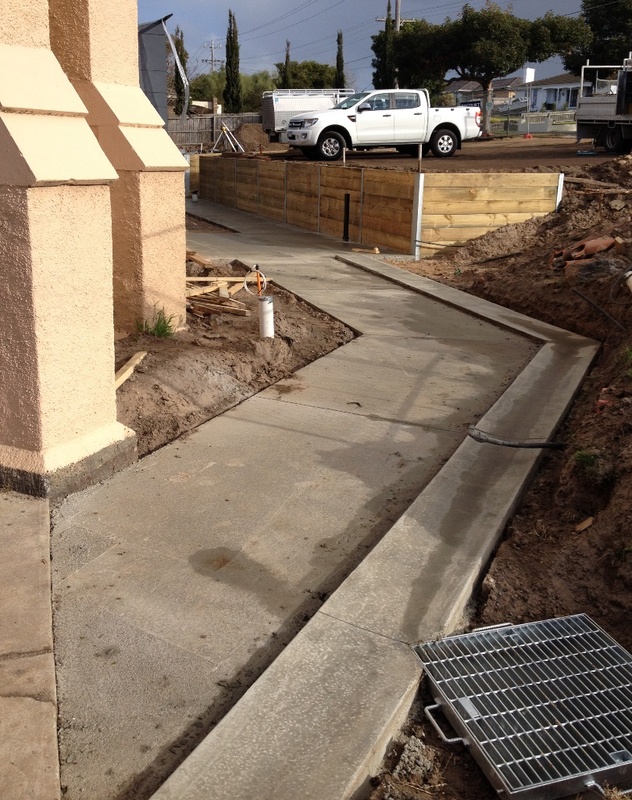 A big day of concreting last Friday now sees most of our new paths and stairways and drains and ramps in place. These are due to be covered in blue-stone pavers shortly. 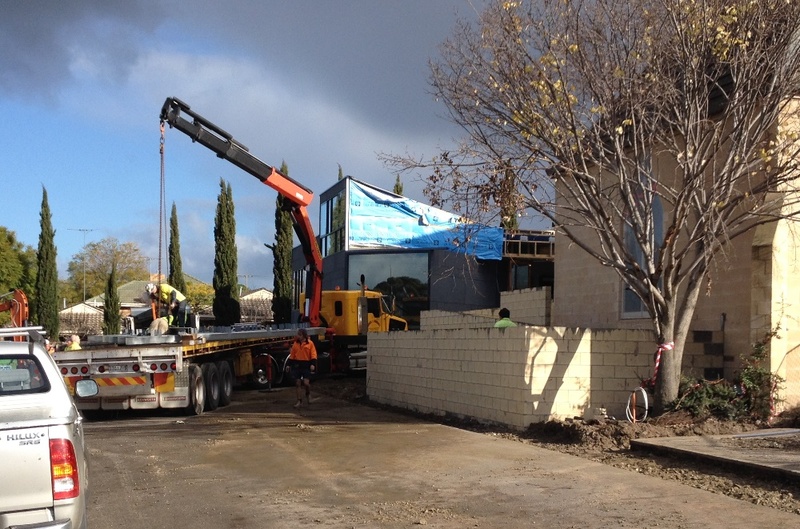 The final piece of our Prebuilt puzzle: the entry-way canopy has arrived and is being installed. 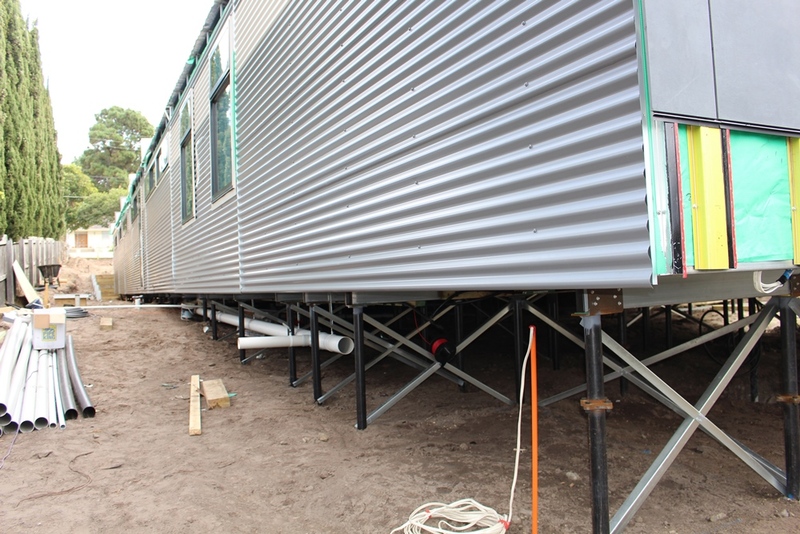 Funding update: praise God for the progress on this front also. As of Sunday 31st May our ourstanding balance is just a little over $60,000. We're nearly there! 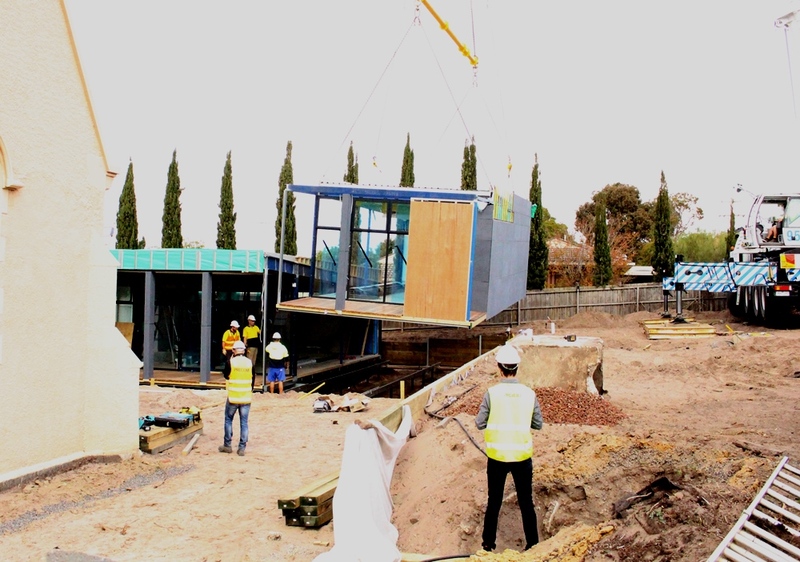 More info on our Building Projectpage. 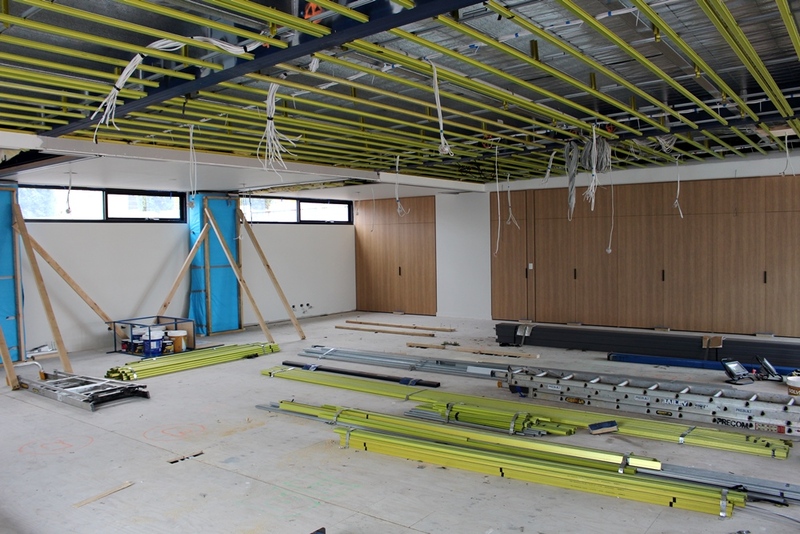 Late last week we got to have a sneak peak of all the action happening inside our new buildings, as the various tradies fit out these great new facilities. The below video (a bit patchy sorry) gives you a peek inside. You're invited to come and join us for our first Sunday on May 31st: 8am, 10am and 5pm. We're also planning a series of larger and smaller 'housewarming' events throughout the months of June, July and August. 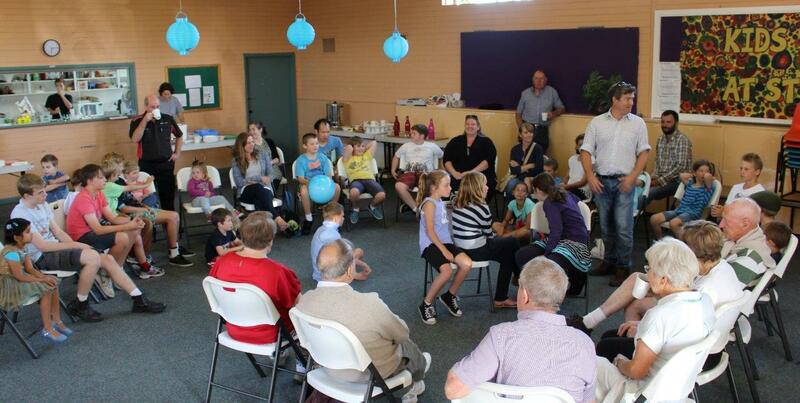 Events like youth group pizza night and reunion, Bowls Club tour and morning tea, a musical soiree, and more. We'll update this blog and our facebook pagewhen the events have a date and some info. 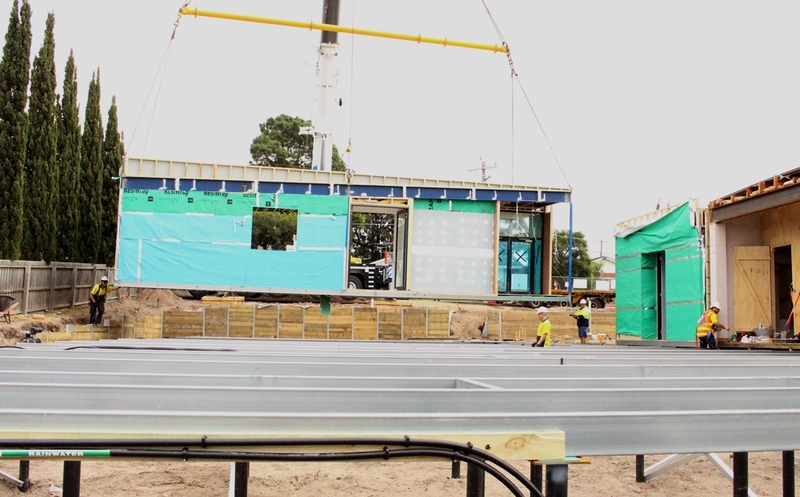 Our new buildings are being fitted out - May 2015from St Johns Hightonon Vimeo. The full set of new building modules are now installed! The huge work crew made short work of final module installations this morning, completing the set by 11am! 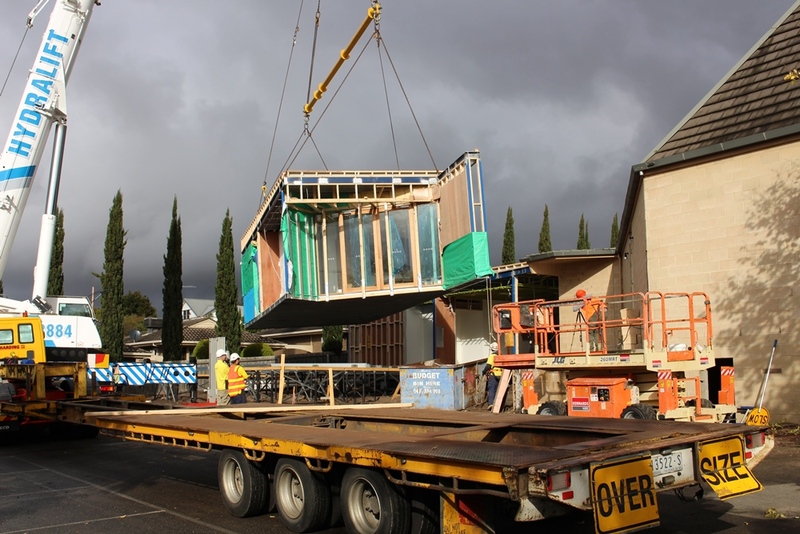 The four remaining modules were lined up and ready for unloading at 7am, having driven down from Kilsyth in the middle of the night. 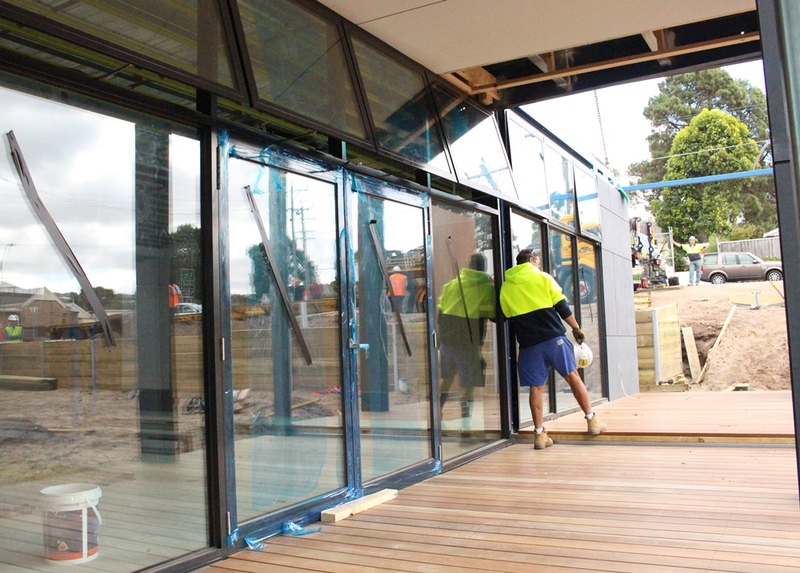 Here comes the Kitchen (you can see both servery windows), along with the doors and walkways connecting to the foyer (left hand side). There were more than just eyes on the ground watching the installation. 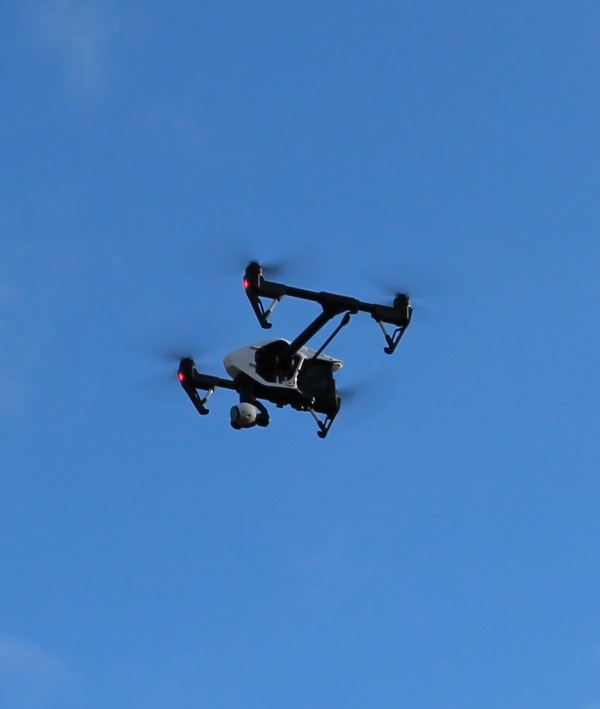 Prebuilt (our design and construction company) were recording proceedings from the air. 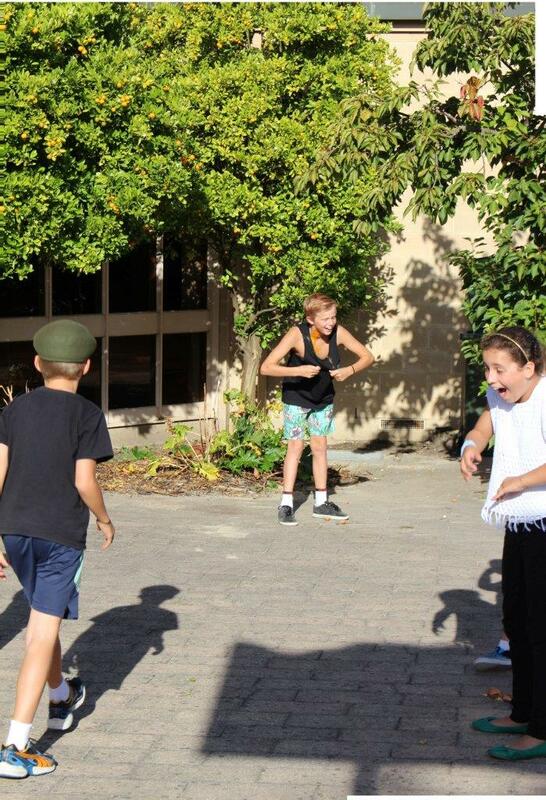 We look forward to seeing their footage! Never far away from the action, the St. John's Building Inspectors monitor all progress: Ken Hudson, pictured (and John Anderson behind the camera). Enter our new entranceway. 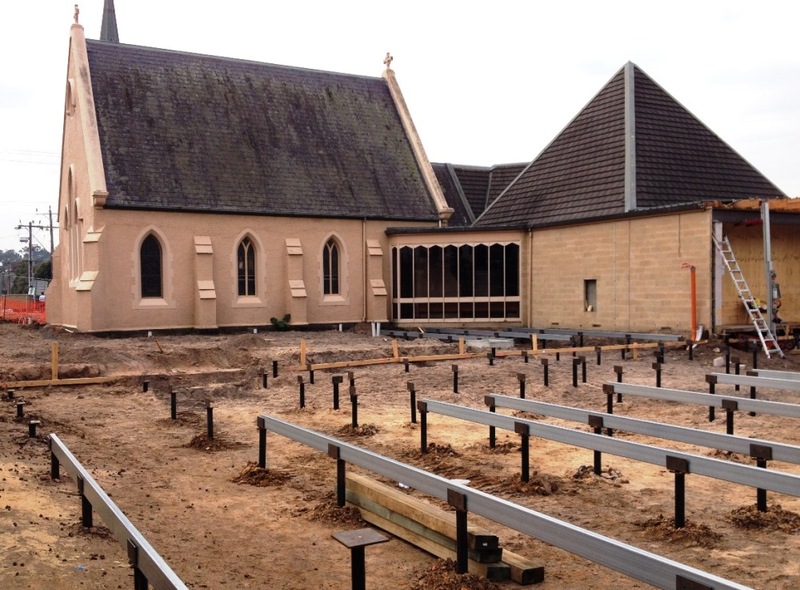 This is the all-important piece of the jigsaw linking up new and old, linking up the church auditorium with the Hall, Kitchen, Toilets and office. Lots of glass and highlight windows means a bright and roomy feel within the various sections of the new building. Notice the large window looking from the conference room area towards the carpark. Compared to previous, it will be so much easier now for visitors to find the front door and to make contact with people. Just what a church should be working hard to do: connect people with each other and God. A view along the southern fence straight through to South Valley Rd. Notice that the building is all one level. No more steps to navigate up for those with limited mobility. One level makes for much improved movement around the site. You can also see the plumbing pipes underneath: water has already been connected up! The full set of modules are in. 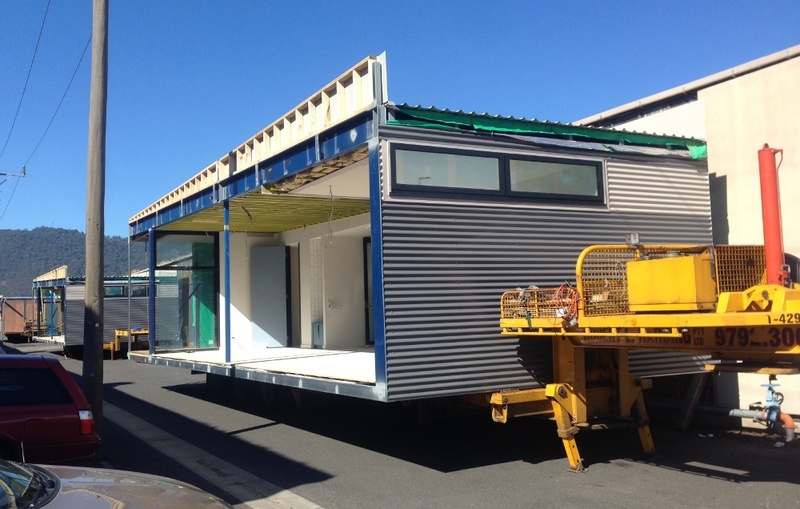 The installation crew have completed their work. There is both relief as well as excitement (with many onlookers dropping by to watch the installation action). 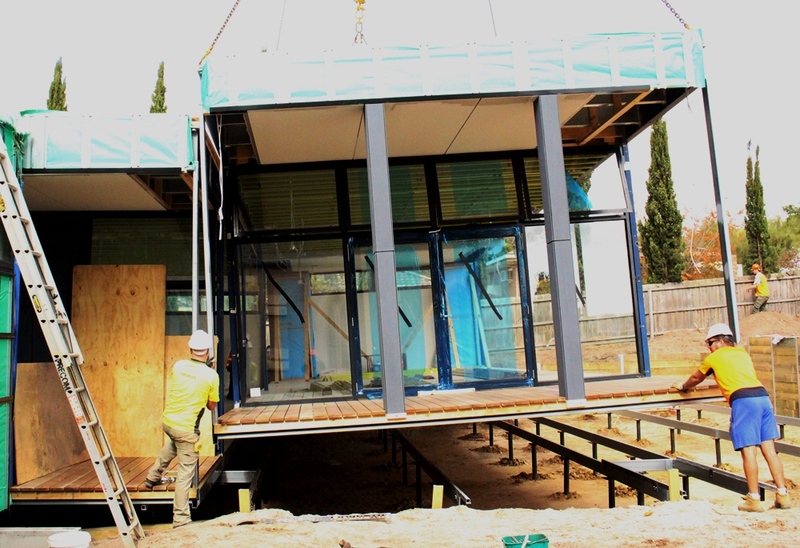 The last remaining unit to be fitted is the entranceway canopy (with some final decisions being taken shortly to address this). 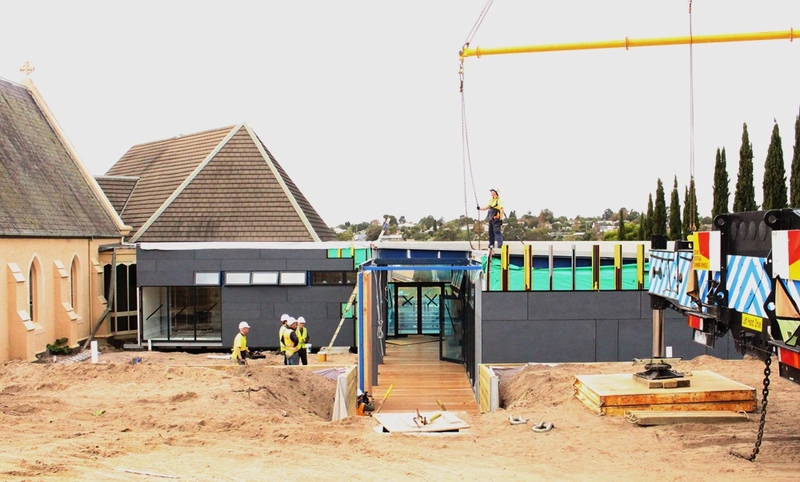 The canopy will join up and complete the roof lines from the existing foyer to the new foyer. We expect it to complement and highlight this front door to our church community. concreting work: paths, ramps, steps, carpark curbing etc. and the myriad furnishings and fittings to come. 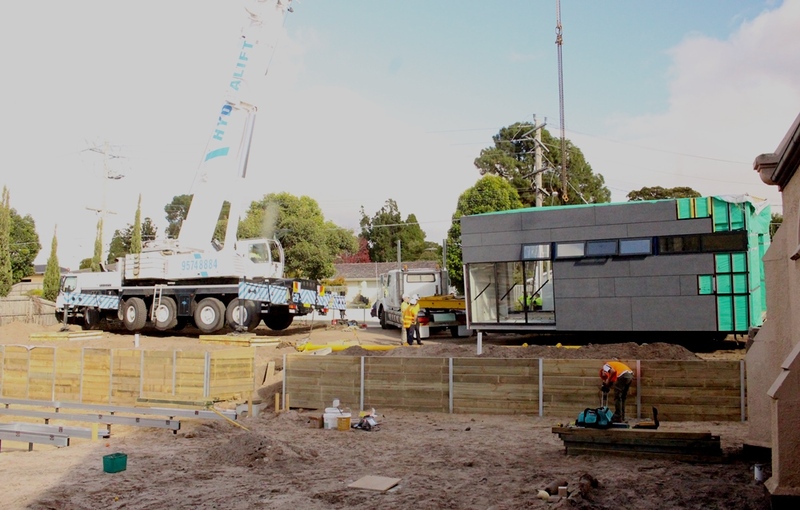 Much to do, but the plan remains on track and on budget: Our plan from months ago had the modules being installed today: we're on track to the day! 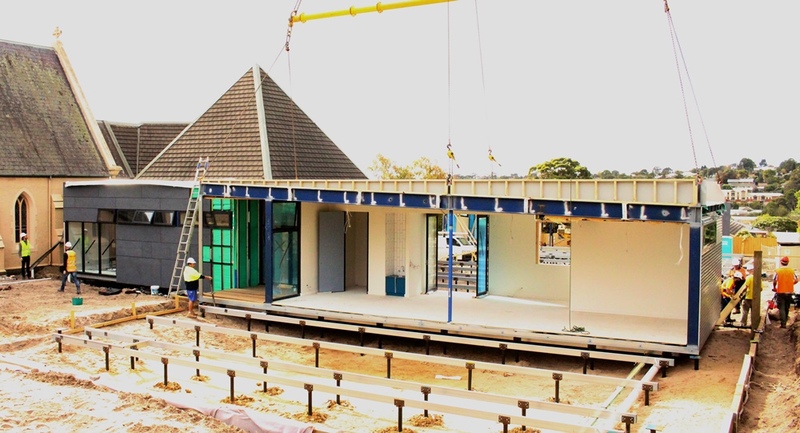 Isnt it amazing that in 14 weeks a whole site can be transformed like this? A quick peek inside the Hall yesterday shows a huge, well lit space with some beautiful deep cupboards. 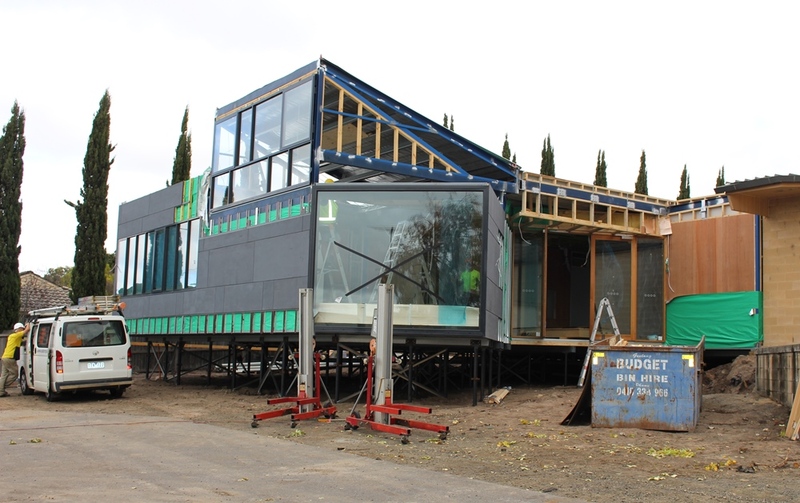 Notice the operatable walls (behind the blue packaging). The Hall opens out into a covered walkway (some call it a cloister), which itself flows immediately into the courtyard: at the same level, and covered with astroturf: perfect for kids. Our basketball ring is also returning around the end of the Old Church. But more of this in coming weeks. Praise God for this excellent work, in what we pray will be a site filled with excellent gospel ministry: building men and women, boys and girls to know, love and serve Jesus their lifelong. 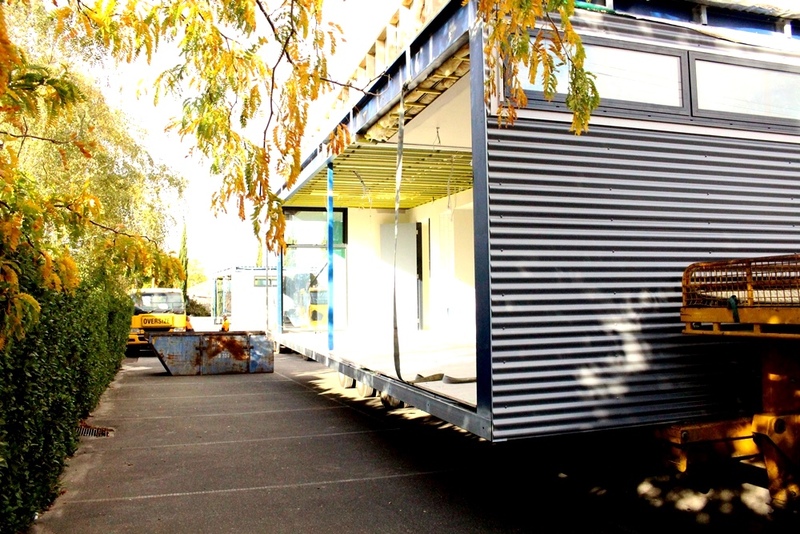 Should you be interested, we are still needing to raise the final colspan='1' $95,000 for this $2m+ project. Are you in a position to contribute? If you are, our Building Project direct debit form is here, cheques and other donations can be received at our church office, or you can contribute via the Offertory collection process at church on Sundays at Christian College. 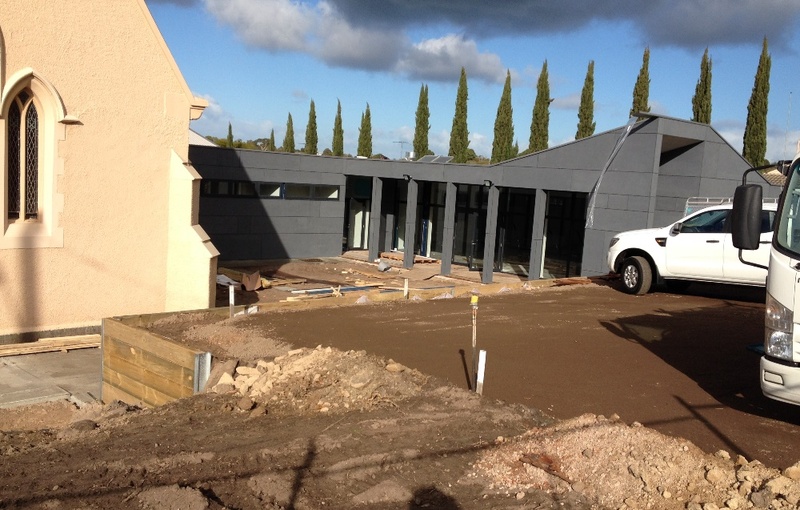 We're on track to have our first Sunday meeting in these new buildings on either 24 May or 31 May. 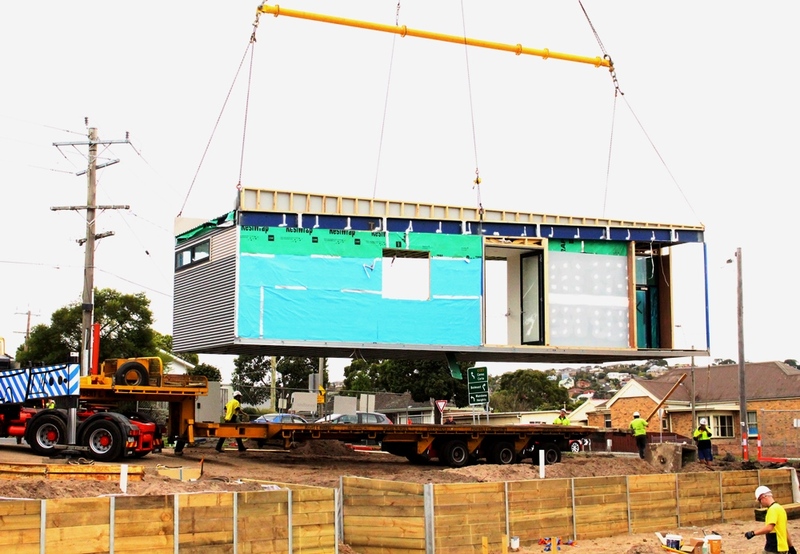 On time, on schedule, on budget and on cue the first five modules of our new buildings have now been delivered and placed in position. 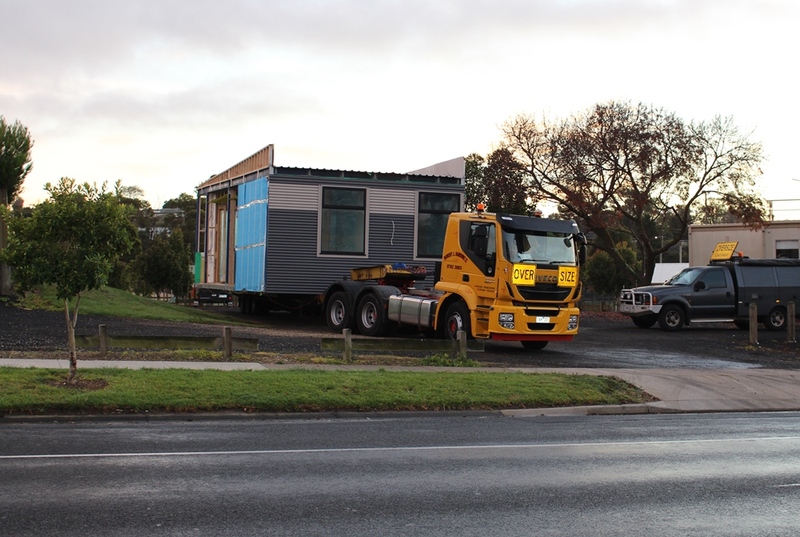 Some early-risers were on hand to greet the buildings which travelled down from Melbourne overnight, arriving on site after 5am. 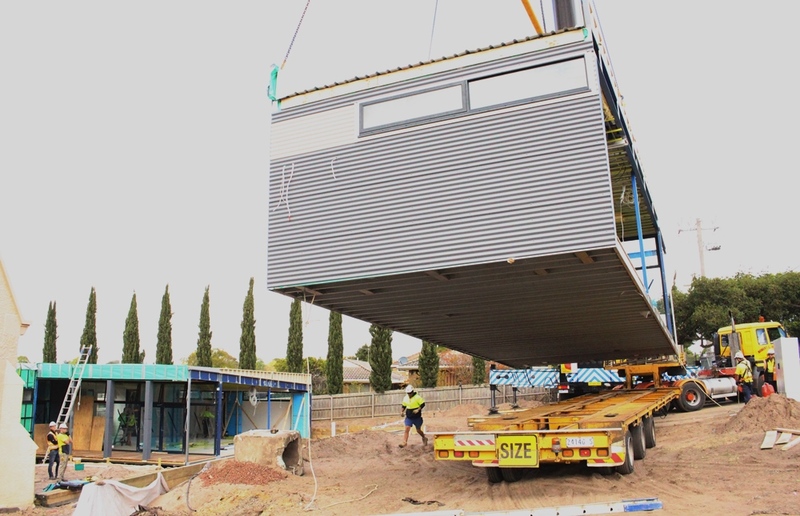 By 11am the first three modules had been craned into place, beginning with the Parents Room. 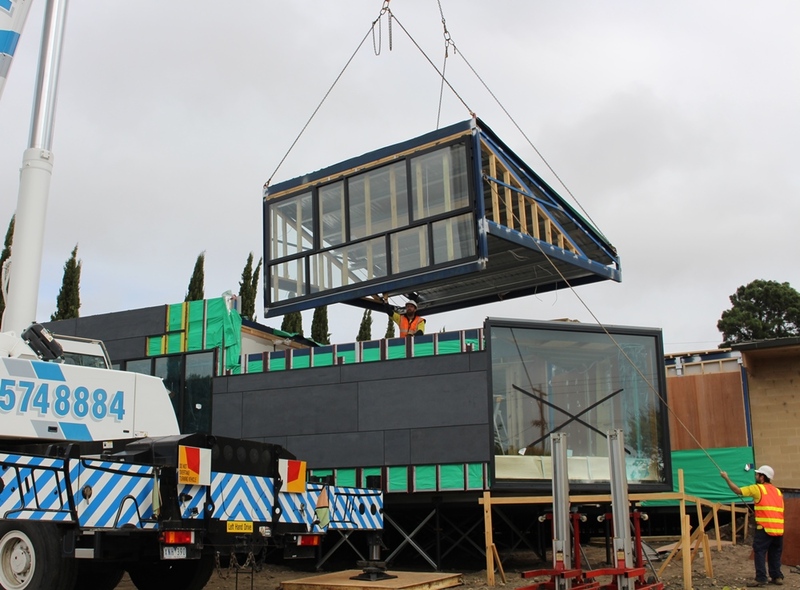 After so many months and years of planning, it was exciting to see these modules so effortlessly picked up and within minutes positioned in place. New Hall arriving in pieces and being positioned togetherfrom St Johns Hightonon Vimeo. 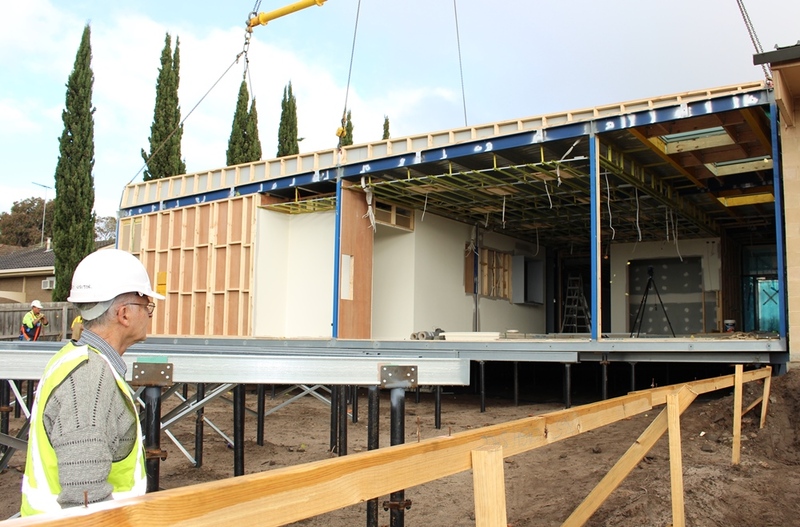 After the parents room, the three Hall modules were unloaded. Above is the first of these pieces. 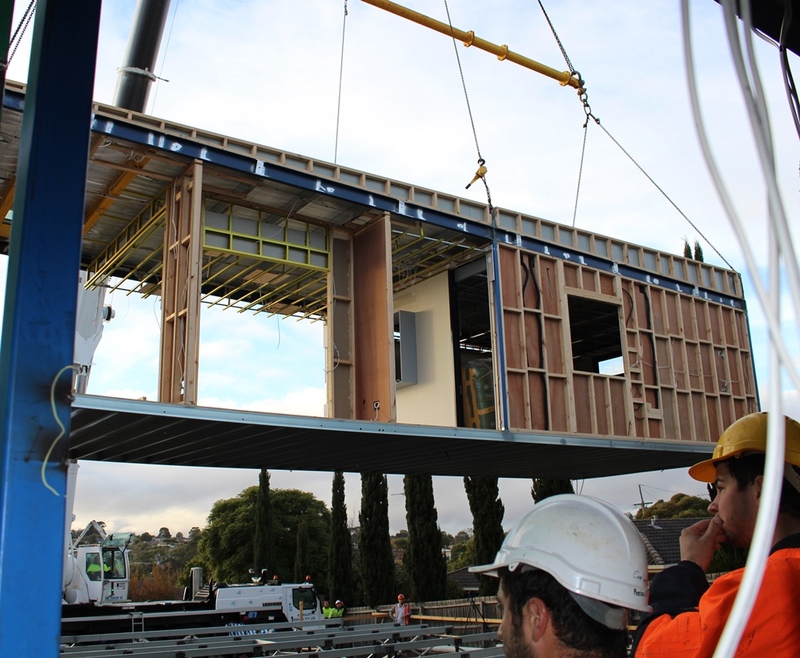 Below is the final Hall module coming off the truck and being slotted into place. And there you have it. 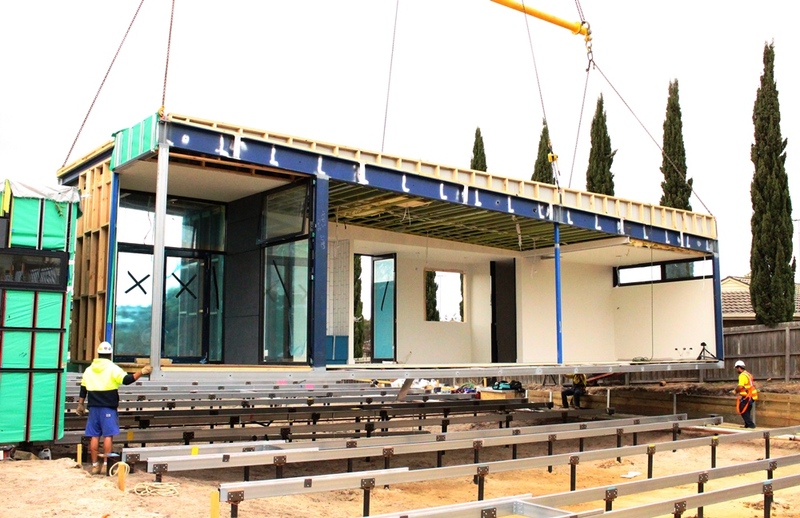 A brand new Parents room and Hall in position - as simple as that! 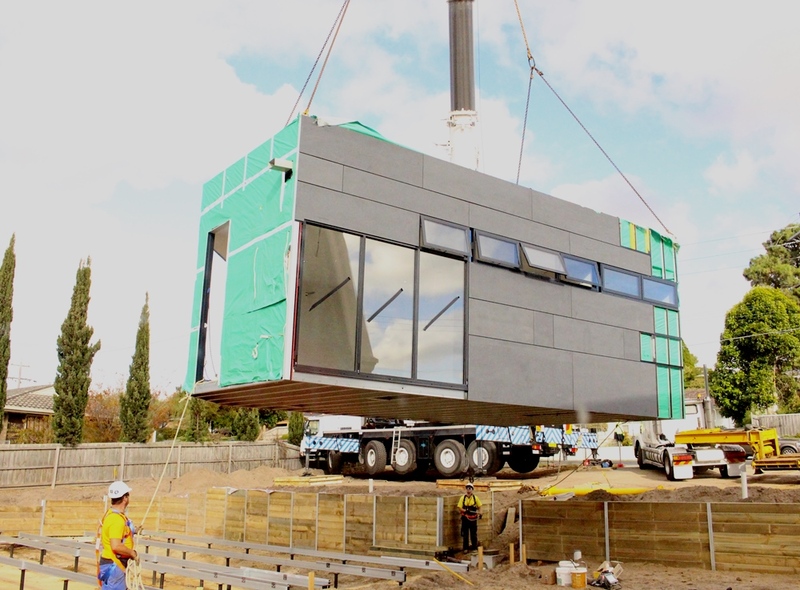 Tomorrow the crane will unload and position the final four modules. Praise God for this great progress! If you're interested in more of the work and plans that have led this day, have a look at our Building Projectpage. 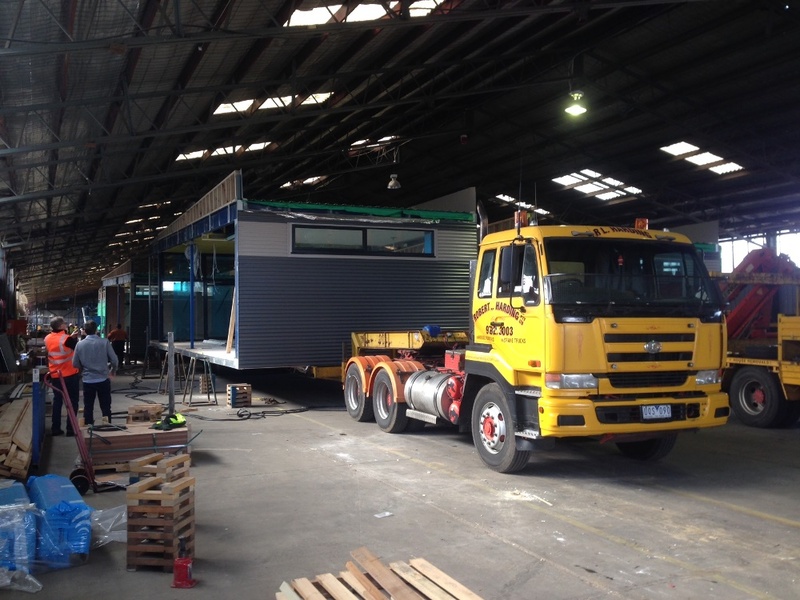 The site is now in readiness, and the Prebuilt buildings are being loaded ready for transport and delivery across Wednesday and Thursday. Exciting times! 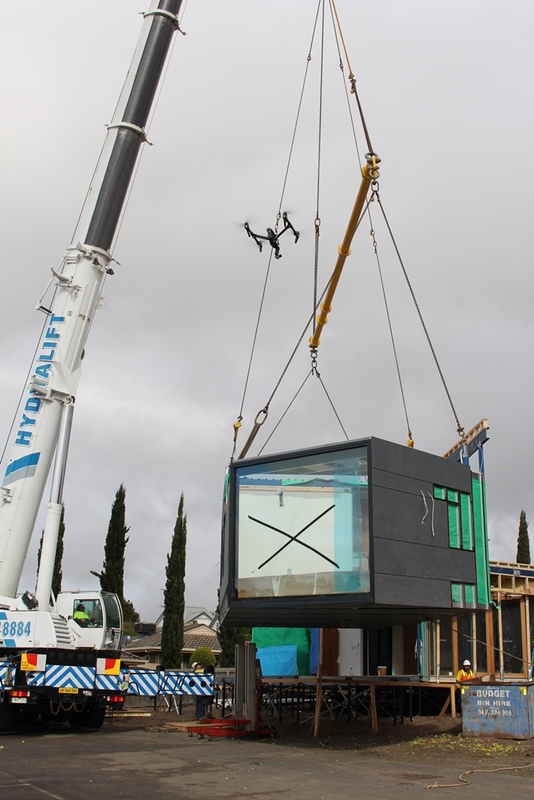 In total there are 9 modules for transport, five of these are arriving and being installed on Wednesday, the remaining four on the Thursday. A complete set of photos before, during and after our building project is available on the Building Project page. 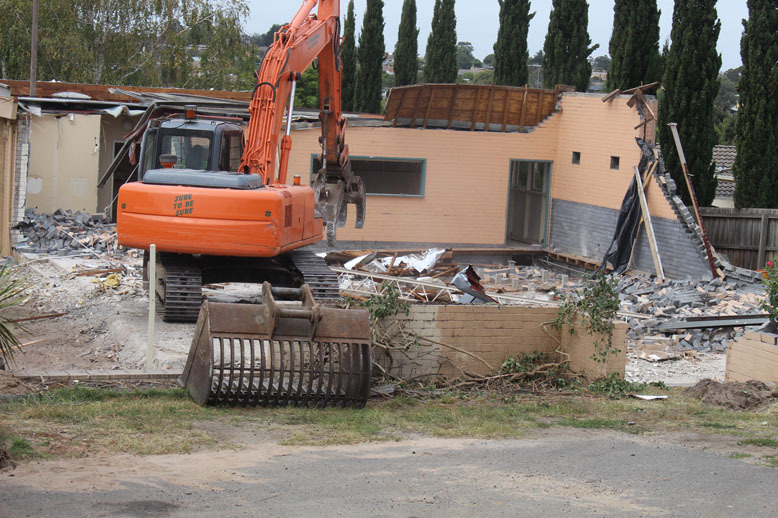 Just four weeks after the old buildings were demolished and removed, we're now really close to having all the foundation works complete, in time for the new buildings to arrive next week! The new building will rest upon piles that have been screwed down into the hard soil foundations. Metal bearers are affixed to these. 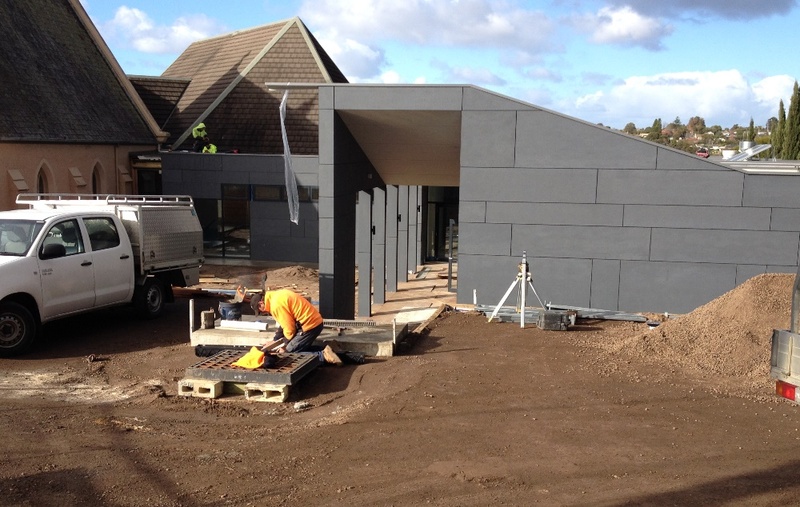 You can see more of the site preparation works on our Building Project page. 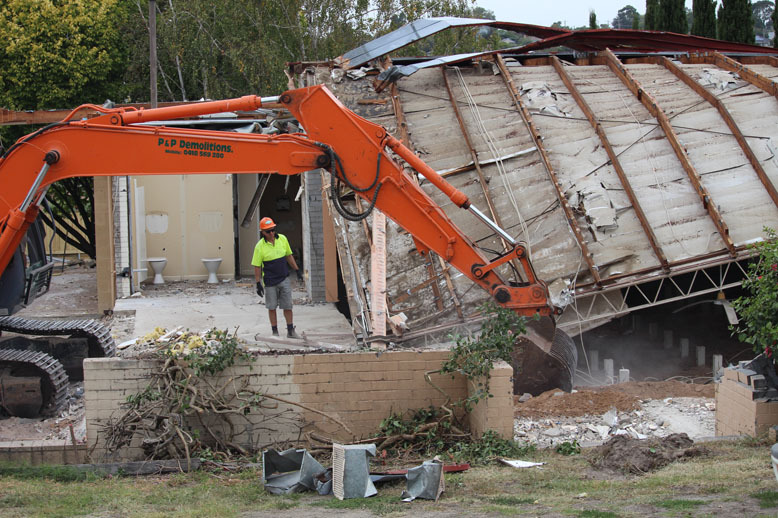 You can see more of the demolition works on our Building Project page. Ken, together with Kara Martin (who was a St. John�s member some 20 years ago!) 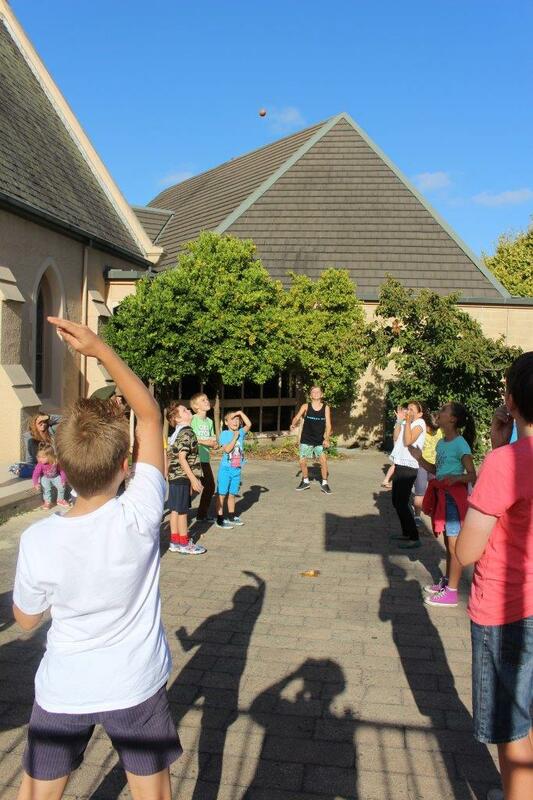 are from the Ridley Melbourne Marketplace Institute, and their aim is encourage Christians like us to share the good news of Christ in the many public settings we find ourselves in (workplace, school gate/canteen, probus club, footy team etc). Having outlined different approaches to engaging Christians have taken, and citing Paul�s speech in the Areopagus (Acts 17:16-34), Ken went on to commend an approach which lovingly seeks both to affirm and to challenge the hearer. 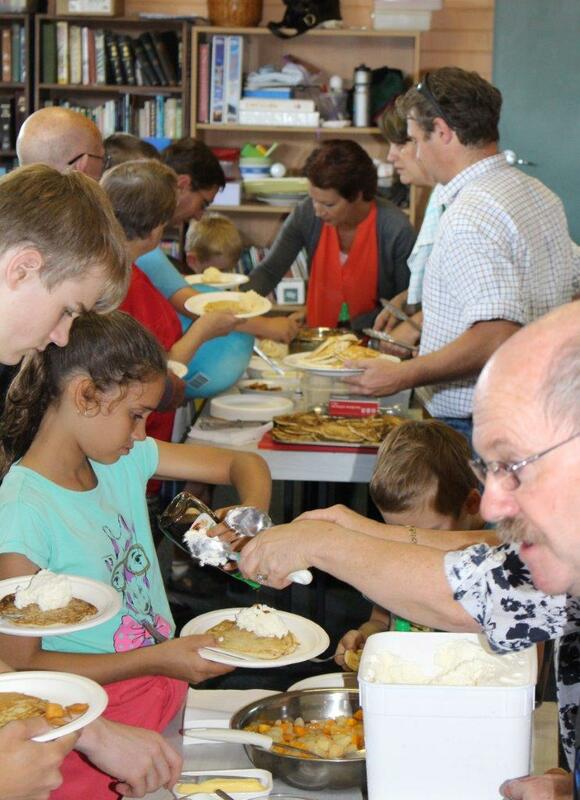 We thank God for Ken and Kara�s generosity and willingness to join us for the night. 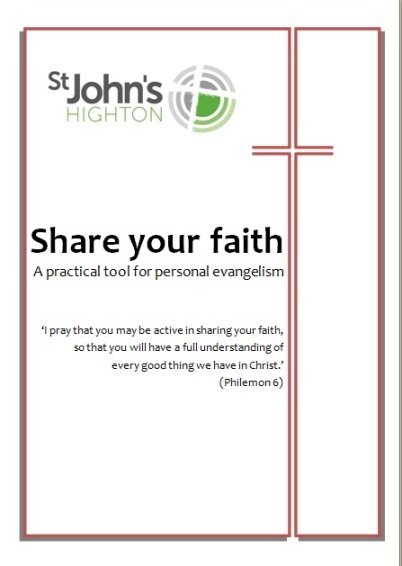 We pray that God might use us to more eagerly engage and share our faith in the Lord Jesus. 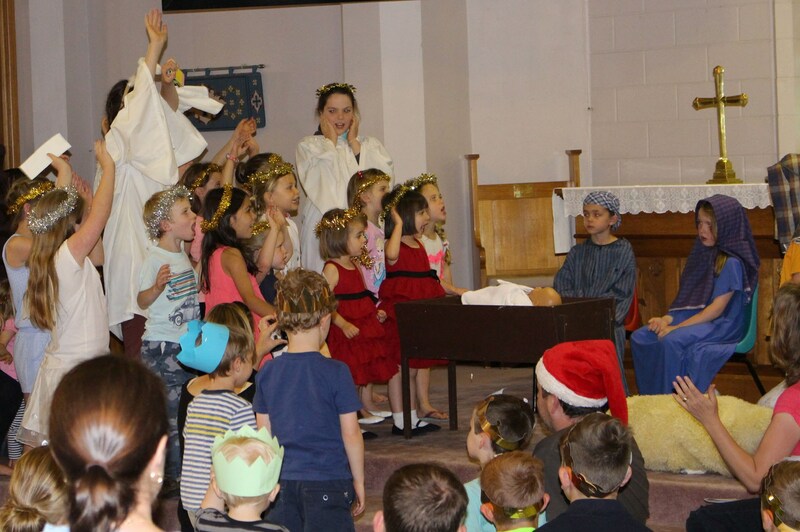 With a bumper crowd at Carols in the Park and many from our local community attending a service, this Christmas at St. John�s has seen our community coming together to celebrate Christ. Praise God for Christmas! Read on for some of the sights, sounds and highlights. On a beautiful summer�s night at Carols in the Parkwe were joined by locals, the MicMacs, Shandelle Cooke and our own St. John�s band, for a night of singing of the Saviour. Later in the evening The Big Christmas Gigfor high schoolers made its debut appearance. 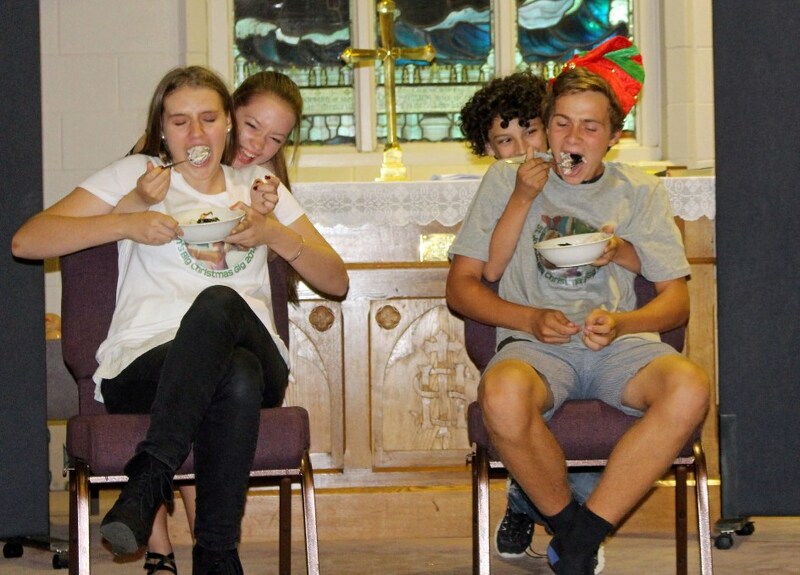 While some were a little nervous with our messy games (including �put away your pudding�), we all appreciated our fine band � with their own Like-A-Version takes on Jingle Bells, and we took a moment to consider the joy Jesus brings and our response. We�re already looking forward to such merriment again in 2015. Speaking of singing, our Christmas Day family servicerevealed some community talent: during our opportunity to meet, mingle and swap autographs (for one of the segments), we found some talented Christmas singing soloists. As they stood, they sung to us, in true �carolling� form, the chorus of O Holy Night. What a treat. Read the articles and then join in the discussion over a simple dinner on Tuesday Nov 18th 7pm for dinner (gold coin donation).�Find all the articles here. Happy reading! �The Lord gave and the Lord has taken away; may the name of the Lord be praised�(Job 1:21). Of all the tensions and troubles we have concerning the presence of evil and our experience of suffering, none is greater than the issue of God�s justice: How can God really be good when he oversees and permits evil and suffering? How can God really be in control and not accept some of the blame for evil? And even as we attempt to come to terms with God and evil and suffering more broadly, so we also face the daily details of how trouble takes hold of us.